PubhD – Three researchers enter, only three come out alive! Due to the Tricky Trees being at home on the third Wednesday of the month, PubhD found itself moved forward by seven days. How would it cope? First up was Rossella, a law student looking at witness protection measures at the International Criminal Court. The ICC was set up in The Hague in 2002 to look at cases of genocide, war crimes and crimes against humanity. They adjudicate on matters relating to the 123 signatories of the Rome Treaty (which includes the UK but not the USA). They currently have 9 cases under investigation, all of which are in Africa (leading some wags to dub them the African Criminal Court). One of the current investigations is into the president of Kenya. At the elections where he became the leader of the country, there were violent clashes between his supporters and those against him leaving over 100,000 people dead. The ICC thought that he was involved in this but they had to drop the charges in 2014 due to a lack of evidence. People were too scared of the president to come forward and testify. So, now if any witnesses come forward, the ICC have to get them out of the country. Do they have a job? Which family members will they bring with them? What if they have two wives? When does the risk end? When can they go home? More pertinently, if you’ve never showed any inclination to leaving the country before, how do you go about getting a passport and a travel visa without arousing suspicion? Most of the time, they claim that they are going to visit a sick relative. However, the whole idea of witness protection raises more questions about the idea of a fair trial. How can you defend yourself against an anonymous witness? Unfortunately, Rossella wasn’t allowed to meet any of the witnesses in the protection scheme. I guess that’s just in case it turns out that she is an assassin who has spent the last three years getting deep undercover. Key learning: The ICC has their own jail for witnesses who are already in prison and so witness and defendant can end up in the same building. Next up was Benjamin whose microbiological research was looking at new diagnostic methods for tuberculosis. TB, along with cystic fibrosis, bovine TB and paratuberculosis are a type of mycobacteria, which is characterised by its waxy cell wall (in fact those four are the “big hitters” of the mycobacteria world). The problem with identifying these at the moment is the length of time it takes to get a culture, which can be weeks or even months. Compare this to e-coli, which is overnight. A long time to diagnose means a long wait until treatment can start and also means that the carrier could be potentially spreading the disease in the meantime. Just like in CSI, we want to use a PCR to identify the disease. These work by amplifying the DNA, but it’s a struggle with mycobacteria because of the thick cell walls. This is where bacteriophage come in. The phage can infect a TB cell in a matter of hours. When they subsequently burst out of the cell, DNA is released. Now we can do a PCR in around five hours rather than having to wait up to 16 weeks. The phage also has the benefit that is only works on live cells, whereas normally the PCR can also detect dead ones. Fortunately, phage is very cheap – the expense in this kind of diagnosis comes from the PCR. However, tests should be in the region of £50 for a human and £15 for an animal. With bovine TB a hot topic in this country and the BCG not being 100% effective (our cows currently aren’t allowed through Europe), this test could literally save lives of not just humans but of cows and badgers too. Key learning: Bacteriophage are the most abundant organism in the world. Finally, we had Chris, looking at how our bodies produce energy and how this changes as we get older. Mitochondria create our energy and they are present in every cell in the body apart from red blood cells. There are around 1,000 in each cell and over 37 trillion in our body. However, they are so small that all of these put together would still be smaller than a grain of sand. To look at the changes of energy production over the lifetime of a human would take far too long. So instead, Chris is looking at C Elegans. This is a worm that lives for 2-3 weeks and enables research into how mitochondria work over a lifespan. As we get older, we lose muscle. The muscles that we have also become less efficient. And yet, our muscle fibres don’t change. However, the mitochondria do and as we age, they produce less energy. In fact, in the worms, after 25% of their life, they are producing 75% less energy. Of course, there are limitations on what we can learn from worms as they have no tendons and they have no satellite cells (which are muscle stem cells). So, the other research Chris is doing is in humans and looking at the effects of painkillers such as diclofenac and how they change the energy that the mitochondria produces. They took two groups of people and trained them for 12 weeks. The placebo group showed an increase in energy production while those on diclofenac did not. This leads to quite an interesting question – is there a ceiling to the amount of energy an athlete can produce? We learnt that there was a correlation between mitochondria function and VO2 max output. The higher the mitochondria function, the higher the VO2 max. We also learnt that a couple of billion years ago, mitochondria were bacteria. Key learning: C Elegans was the first organism to have it’s DNA genome mapped. 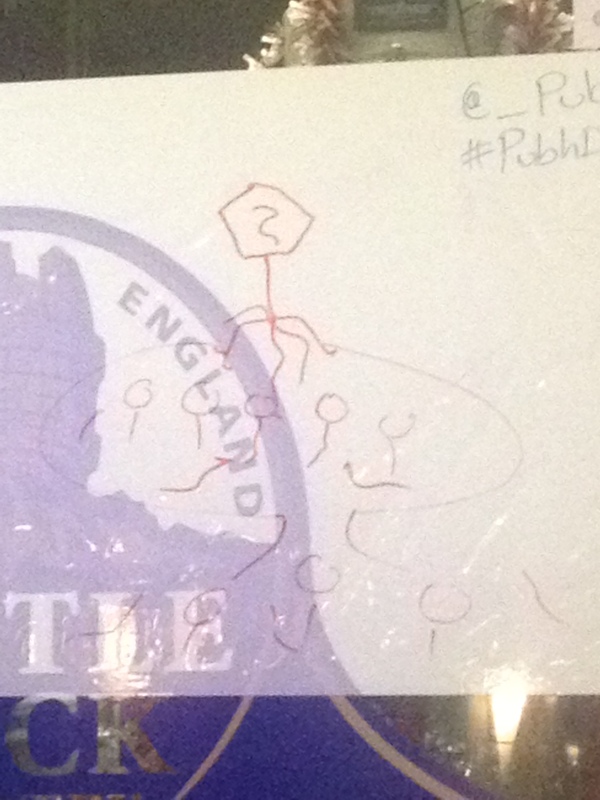 PubhD will return with Materials Science, Mapping and Education on 22 April 2015 at the Vat & Fiddle. This entry was posted in Reviews and tagged Ageing, Cystic fibrosis, International Criminal Court, Law, Medicine, Microbiology, PubhD, Tuberculosis by Gav. Bookmark the permalink.